The Team at Buxton roofing is proud to accept the award of 2016 Firestone Master Contractor, by accumulating Quality Points for achieving exceptional inspection ratings on Firestone Red Shield™ warranted roofing system installations. High quality workmanship and a commitment to long-term roofing system performance are the attributes of a Firestone Master Contractor. This award recognizes only the top achieving contractor firms in North America and Latin America who meet their criteria for determining the best of the best. Buxton Roofing specializes in commercial roofing services, including new roof installations, repairs and roof maintenance and on facilities throughout Northeast Ohio, including Canton, Akron, Stow, Hudson and Twinsburg. We understand that hiring a commercial roofing contractor for a new roofing installation or major repair represents a large investment. That’s why Buxton Roofing emphasizes the utmost in quality and care with all of our commercial roofing services installations. Choosing the right commercial roofing system for your building or project is one of the most important decisions you will make. The right roofing system will protect your investment for decades, while the wrong roofing system could result in costly repairs, damage to the building and its contents and possibly an early tear-off and re-roof. We will evaluate your roofing system and do all that is necessary to prolong the life of the roof before recommending a replacement. We are your one stop commercial roofing contractor, with a highly experienced and professional team, and we will do everything we can to keep your commercial flat roof repair cost low. 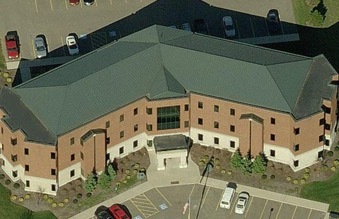 Please continue exploring our website to learn more about all of our commercial roofing services, including the types of buildings and roof systems that we have extensive installation experience or fill out our free estimate form to start working with a highly rated commercial roofing contractor in Canton, OH today. At Buxton Roofing, we offer commercial roofing services, including inspection, evaluation and repair for many different commercial roof types. Repair calls will be responded to within 24 hours. We also provide a comprehensive Preventative Maintenance Program for existing roofs to ensure they provide the maximum service life. Learn more about our repair and maintenance services.